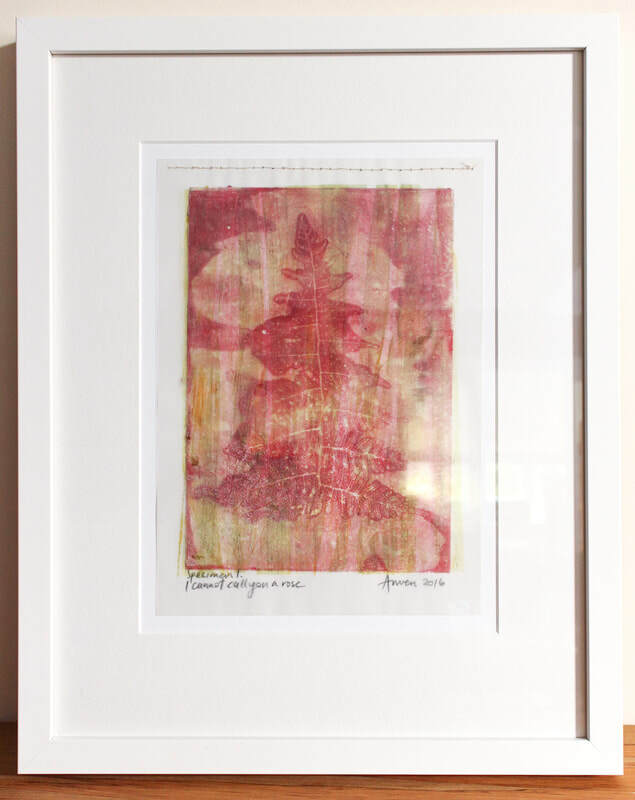 These thoughtful prints combine monotype printmaking with photograms (a camera-less photographic process) and various materials like acid-free tracing paper, linen thread, printed acetate and acrylic paint. I began making them while exploring alternative art making processes during an individual artist residency, completed at the Waygood Foundation in Piha, Auckland, New Zealand during March 2016. During the residency I wanted to focus on the practice of collecting and explore how that affects our relationships with each other and the environment. 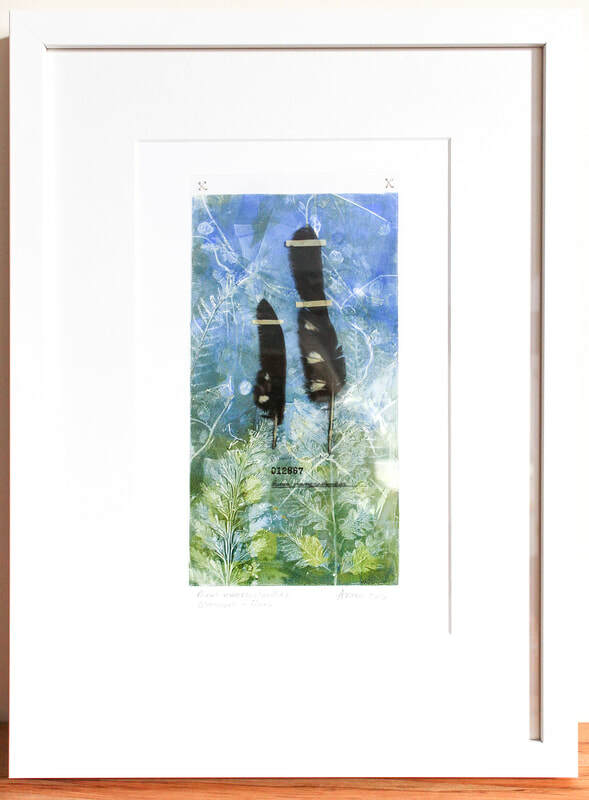 These prints are one-off, unique, hand-made works and are not available as editions. Inspired by the notion that if I discovered a new, uninhabited land, I might leave and choose never to tell anyone about it. 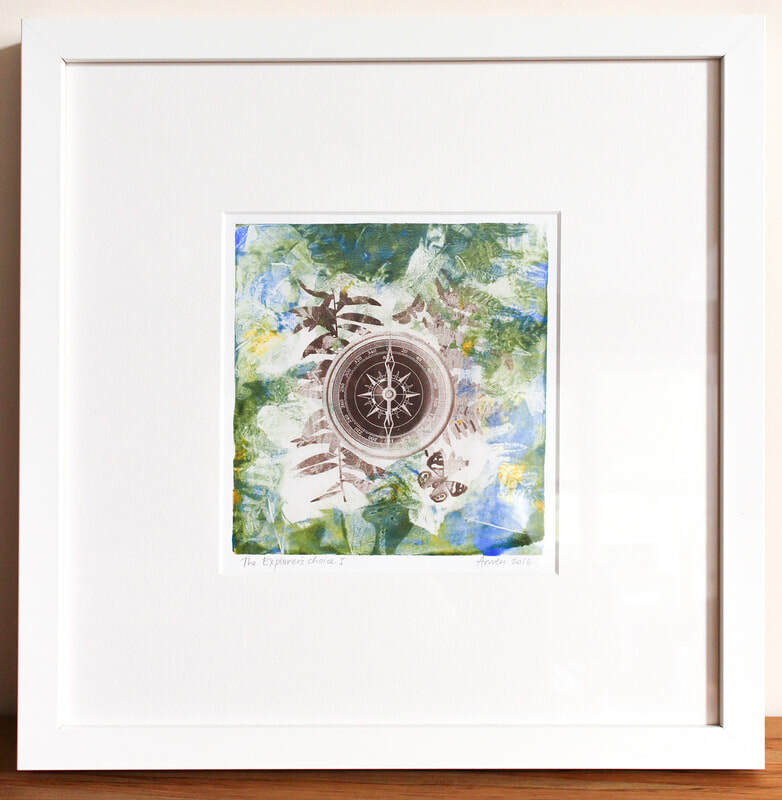 Represented here by the compass with no direction points set among native New Zealand Kauri and fern leaves. I wanted to represent the idea of collecting a specimen sample without actually damaging a real insect. 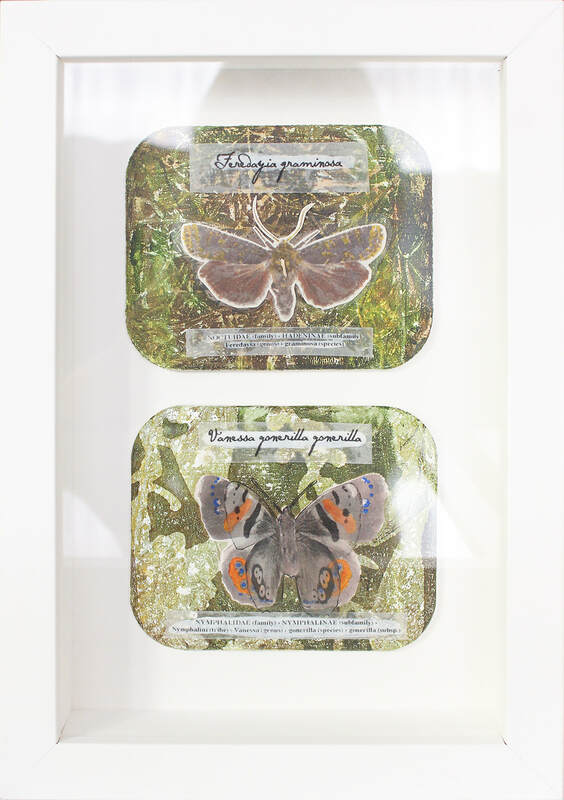 Using a photographic image of the butterfly and moth, hand coloured and mounted in a box with wings of printed acetate. Inspired by the Natural Science process of placing a yellow plastic bowl filled with sugar water and detergent in an area of grasses and bush, to count the number and types of winged insects in the area. 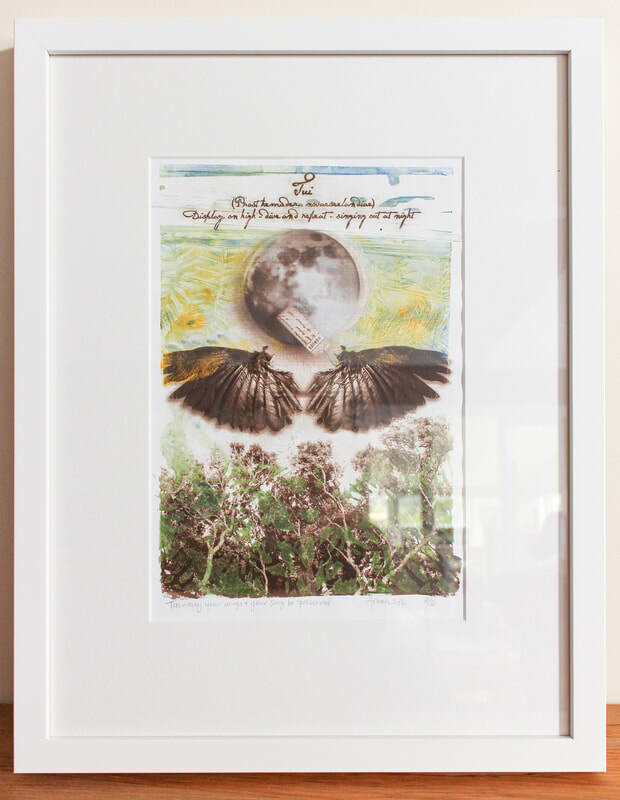 Using an image of a Tui wing specimen combined with images of the moon and local Pohutukawa trees located around the studio. I wanted to bring the character of the Tui back to life (countering the static nature of the winged specimen imagery), to celebrating it's moon-lit, evening, mating dive. 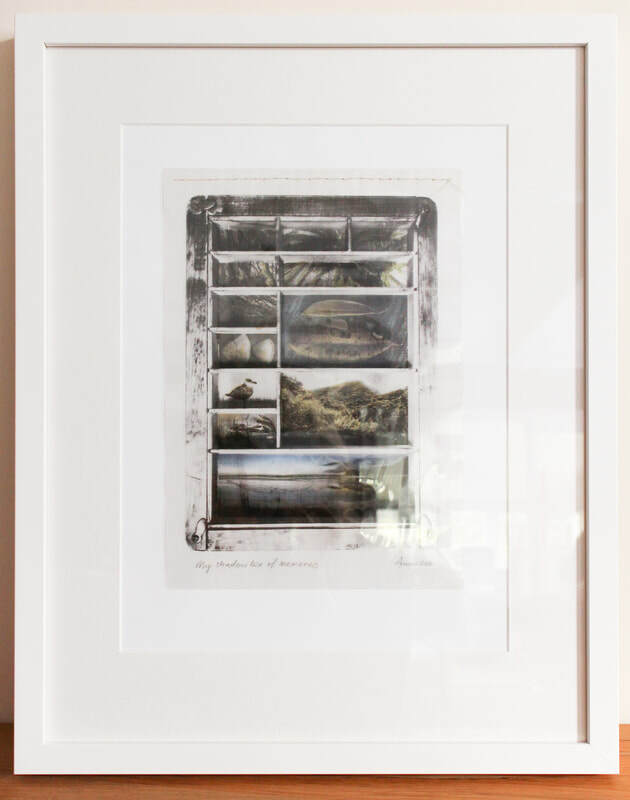 The act of collecting objects and photographs to remember places we have been is a common one. I had a shadow box as a child and used to put vials of sand, rocks and shells into it. Memories fade over time, they loose their sharp details, so I created this piece using layers of paper and acetate, with muted colour, to give the feeling of looking back into our minds eye and into past times. 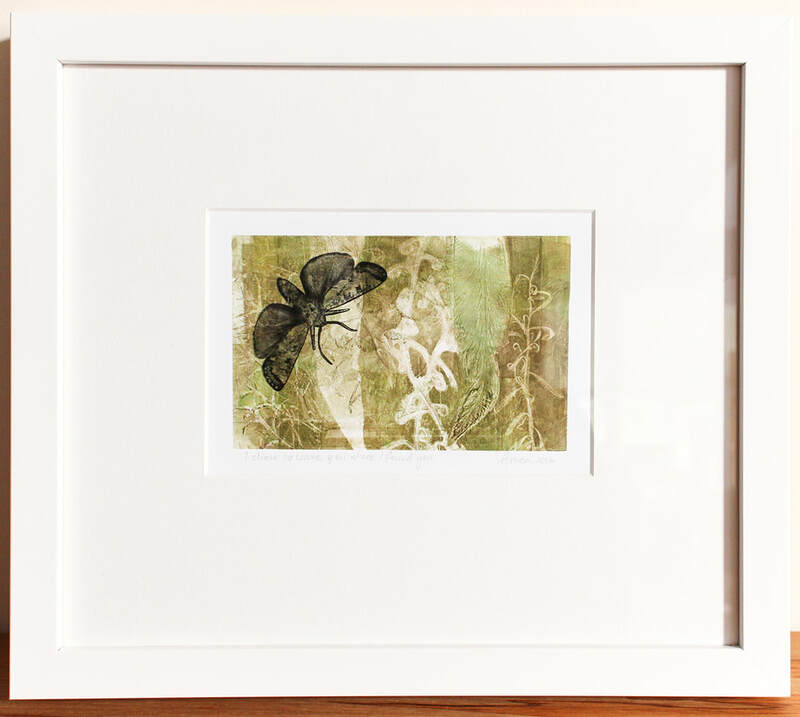 This piece is a way of taking images of real specimen samples from my local museum and putting them into a background of nature, evoking a sense of connection with the place the living creatures inhabited. 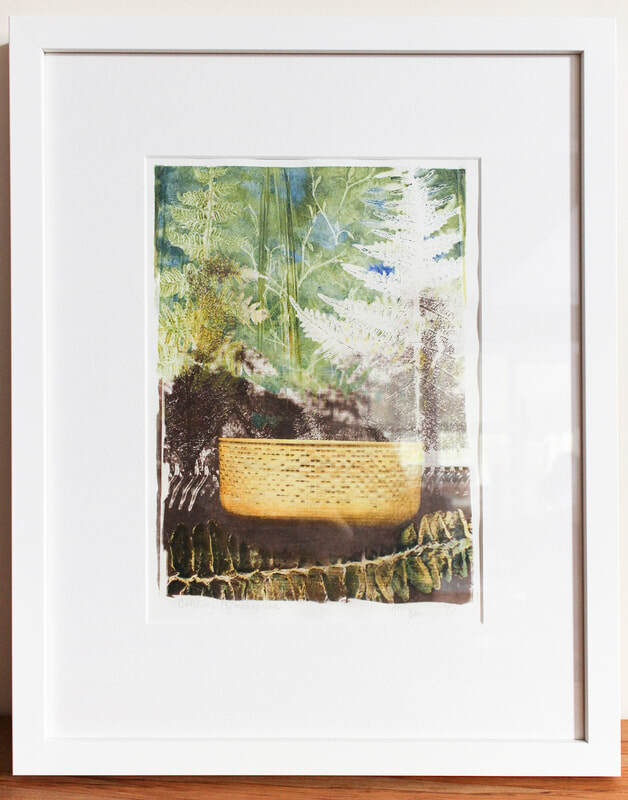 After making this print with layered materials I couldn't find the correct name in my guidebook for the fern I had used. Frustrated I was reminded of a Shakespearian quote (referenced in the title) and recognised that although not knowing the name did not change the nature of the fern for art's sake, it did alter my ability to categorise it, which is entirely necessary when collecting for natural science. I was raised not to disturb the environment any more than necessary. The act of collecting has a way of raising questions about how, when and why it is done. I wanted to produce and image that was scientific in feel. 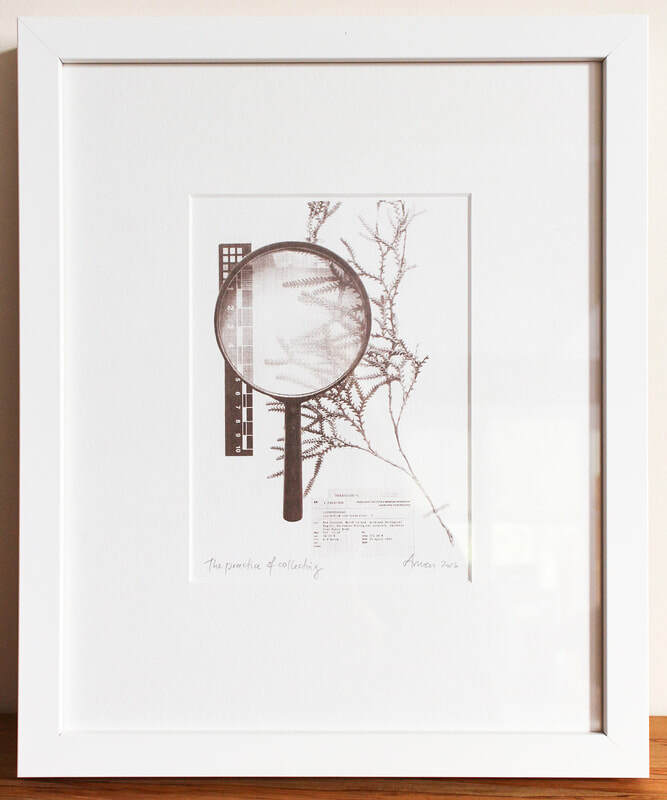 I used an image of my Great Grandmother's magnifying glass and one from a specimen sheet from my local museum and combined the two in a way that seemed natural. The image needed to been clean and simple, so I stuck with the Van Dyke Brown photographic process for this one. It took a few attempts to get the right tones and light/white background.